BOINC is an increasingly popular platform for distributed computing. At the beginning BOINC was used only by the University of California at Berkeley. This system was originally developed for the SETI @ home project. Nowadays it is used by many research centers around the world. Among them are CERN, the University of Oxford and the University of Washington. On BOINC platform there are now 71 active projects*. The OProject@Home is one of them. OProject @ Home was officially launched on August 13, 2012. On the platform several different sub-projects exist. They relate to mathematics (Goldbach’s conjecture), quantum mechanics (Shor algorithm simulation), artificial intelligence, and climatology. Fig. 1. 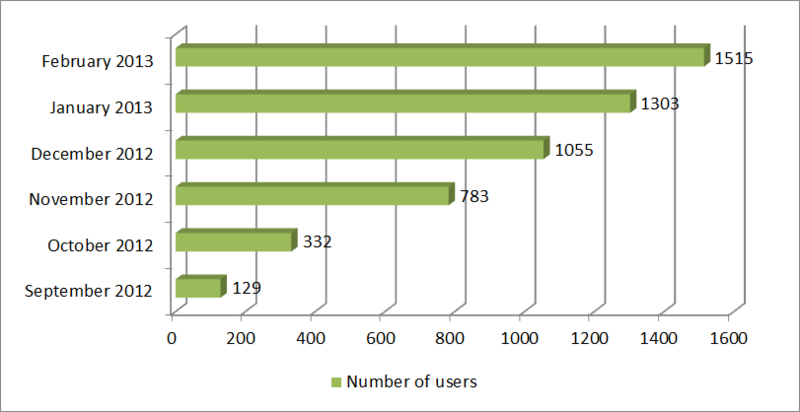 Increase in the number of users in the OProject@Home system. Fig. 2. Increase in the number of computers in the OProject@Home system. By 4 February 2012, total calculation time on all processors accounted for more than 158 years.